Intex Aqua i5HD launched, Will give competition to Micromax Canvas Elanza 2 A121? Homegrown Mobile Maker Intex has come out with a new budget appearing, named Aqua i5HD. As the market of budget phones are growing day by day from few times and almost 80 percent of renowned companies have been got into the market of budget phone’s race. Not the budget range is now the only factor in today’s budget smartphones. Today’s people are also smart and always want a smartphone with smart features at smart price which suits to their pocket. Intex Aqua i5HD is loaded with all smart features and fall in the budget price of Rs. 9,990 and give competition to Canvas Elanza 2 A121 which is also a budget phone of Indian Mobile Manufacturer Micromax and fall in the price range of Rs. 9,999. Going to the specification, the woo factor of Intex Aqua i5HD is its amazing camera with stunning picture quality. It is integrated with a 13MP rear snapper, 5MP of front camera and preloaded with lots of camera apps to make your clicks picture-perfect while Micromax Canvas Elanza 2 A121 gets 8MP of rear camera with AutoFocus and 2MP front facing camera which is also a good experience for clicking the image and for video calling, but stands low than the Intex’s new launch. Both devices get 5 inch display but the differences in the technology make the newly launched smartphone a good handset, as it uses OGS HD display while the Elanza 2 is featured with TFT HD screen. Intex Aqua i5 HD works well with quad-core processor which is used by the Micromax Canvas Elanza 2 A121 also, but both run at different CPU frequency of 1.3GHz and 1.2GHz respectively which is not a major difference. 1GB RAM performs superb with both devices and best to describe both the devices as high-end smart device with budget price. Android 4.2.2 Jelly Bean is used to power the device while Jelly Bean 4.3 version is used in Micromax Canvas Elanza 2 A121. Both have coupled with 4GB of built-in storage and can be expandable upto 32GB using microSD card slot and fueled by 2000mAh powerful battery. On the connectivity front, they are featured with Bluetooth 4.0 and Wi-Fi options. 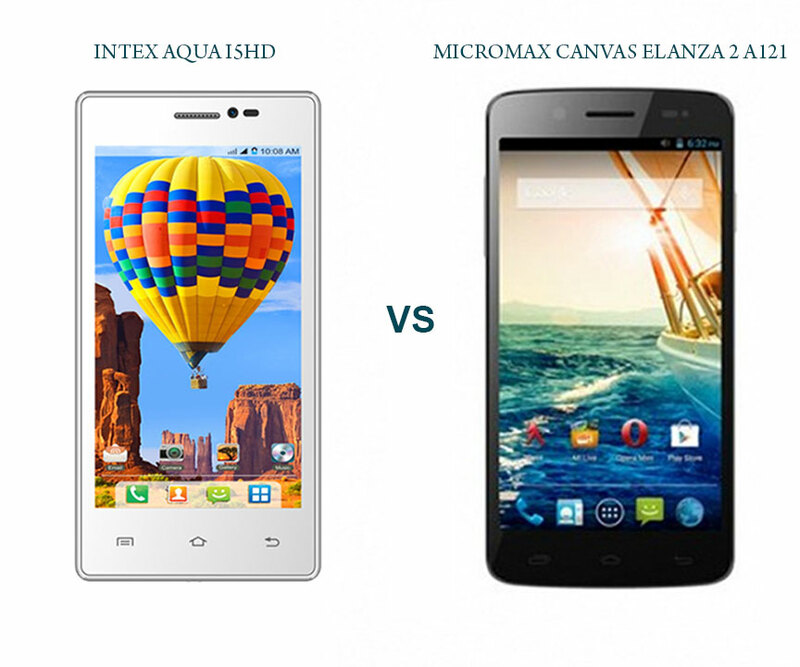 Overall both are perfectly fit in their price tag but Intex Aqua i5HD may woo customers with its amazing camera and smart camera apps which can capture images when you say “Cheese” or “Capture.” This feature puts Intex Aqua i5HD on top from all other budget appearing including Micromax Canvas Elanza 2 A121. Though in all other aspects, both keep the same value with their budget price tag.